83 Lawmoor Street formaly 83 South Wellington Street, Gorbals, Glasgow. 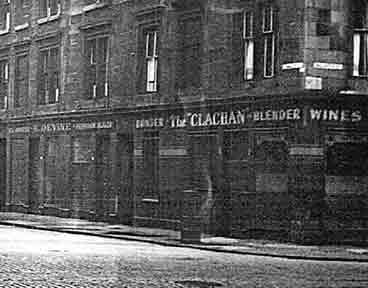 The Clachan bar sat at the corner of 83 Lawmoor Street and 361-63Ballater Street. Lawmoor Street was formerly called South Wellington Street and Ballater Street was called Govan Street. Andrew Nairn occupied these premises in the 1870s, he also ran a small public house called the Snug on the Gallowgate. Andrew Nairn was not just a publican he had another company a China and Oakum Merchant, 43 King Street, Tradeston another member of his family Alexander had a sack manufacturers at 45 King Street, Tradeston. In 1870 before he took over this pub he was trading as a China and Oakum merchant, he also had a pub at 92 King Street, Calton. Alexander Nairn had a Marine store and a bag manufacturers in King Street, Tradeston. The firm was established in 1852, trading at 43 King Street, Tradeston. In 1890 Gilbert Stewart Reid owned these premises along with pubs at 47 Nelson Street (Hamilton Arms) and 436 London Road. He continued as licensee until his death in 1911, his wife Barbara then took over as trustee until the end of the great war. During the 1930s and 1960s William Morrison owned the Clachan Bar, he also owned the Clachan Bar, Paisley Road West. Another view of the Clachan Bar. 1950s. 1919-1911 Barbara Melville Ross Reid.